Math teachers Laura Deffer, Michele Ratigan and Michelle Williams received the Blue Valley Innovative Educator Award Friday. Principal Amy Murphy and district employees present Laura Deffer, Michele Ratigan and Michelle Williams with their Innovative Educators Award. Math teachers Laura Deffer, Michele Ratigan and Michelle Williams received the Blue Valley Innovative Educator Award, presented Friday in Ratigan’s Honors Algebra II class. The award goes to one elementary school teacher and one secondary teacher in the district each year. However, this year was the first year a team, comprised of the three math teachers, was able to win the award. Principal Dr. Amy Murphy decided to nominate the math team after seeing the success in their classrooms with project based learning. 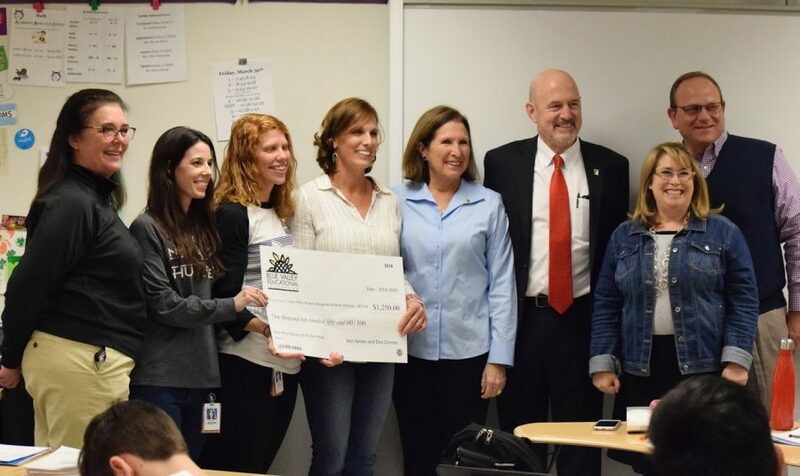 Math teacher Laura Deffer said the award involved all three math teachers working together.